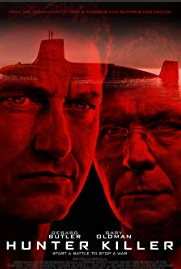 “Hunter Killer” is a fresh take on “The Hunt for Red October”. Unfortunately the plot is weak and the back story virtually non-existent. Deep under the Arctic Ocean lies a US Submarine in distress. American Submarine Captain Joe Glass (Gerard Butler) has been requested to take on the mission of locating the distressed Submarine. The movie is intriguing and very suspenseful, but the plot is lite and the back-story non-existent. The movie is still entertaining and worth a look. It is not as bad as the paid critics made it out to be.